One well-known, self-proclaimed deer expert has defined a trophy whitetail as a buck with antlers that measure 150 or more inches, but for generations of hunters a true trophy hunting experience goes beyond the tape measure. By this definition, the animal itself, or rather the antlers, is the trophy without regard to the experience of finding, watching, hunting or harvesting the animal and without regard to how the antlers were produced. I have solicited stories, viewpoints and opinions from 16 seasoned hunters and a couple of outfitters to represent a variety of perspectives. These contributors have a combined total of about 700 years of hunting experience accumulated on more than 8,000 hunting trips. All of them hunt in Texas, and most have also hunted in other states or continents. Their backgrounds and professions vary, but they all share an intense love of hunting. Many of today’s hunters lament the growing trend that antler score or other measurements are the primary way that success is defined. We too often get caught up in what we think is expected of us as hunters. It is what we see on TV, social media and magazines—killing a “Booner” buck or a longbeard tom with 1 ½ inch spurs. If it’s not an especially well-endowed animal then you are just pretending to be a hunter. That is the unfortunate message that is so widespread within hunting circles today. I have seen a growing emphasis on antler score as the measure of success. We have pushed the ceiling on the size of white-tailed deer through intensive practices, including growing these deer in pens. It creates a false sense of what a “big” deer is supposed to look like, and these cartoon-sized bucks have led to bastardization of hunting values throughout much of our hunting community. People being people, we are hardwired to want things bigger, better and faster. As long as laws permit us to use creative tools to defy Mother Nature, then it’s absolutely predictable that people will integrate these tools which morph deer antlers into gigantic and unrealistic proportions. I believe that some hunters have unrealistic expectations about what constitutes a trophy and that this takes the fun out of hunting. Unfortunately, human nature’s propensity to take a great thing and go to extremes has led to many folks manufacturing bucks that are not reality. Personally, I wish the state did not even allow manufacturing deer. It’s like steroids in baseball. My mother taught me that people are always watching what you do, the good and the bad. So, as hunters, we have to realize that we have an influence on people’s attitude. I just hope our hunting family is not sending the wrong message to those that choose not to hunt about our sport and the way as hunters we are viewed. We have an ethical responsibility as hunters to be seen as caretakers while we are here on this earth and not self-serving only to ourselves. A trophy hunt, for me, involves many things: Beautiful surroundings where I can fully enjoy nature; sharing the experience with my husband or children; challenging myself physically and improving my skills; seeing lots of wildlife—big game, birds, small animals; seeing and learning about the plants, wildlife and habitats in new places. It’s so much more than the tape measure. YOU choose what is a trophy in your own eyes. YOU can choose not to pull the trigger or release the arrow and just enjoy the day for what it is, if that’s what you want to do. While hunting and fishing is in our family’s DNA, the experience is far more important than the end result. While we have taken some very fine trophy quality bucks off the ranch through the years, we are missing the point if we think that is really the essence of hunting. The best, most memorable trophy in my mind was the first buck I ever took, which would have measured about 14 inches on his 3-point rack. So a trophy is truly in the eyes of the beholder. We have hosted over 4,000 hunts over the past 32 years, mostly white-tailed deer. To be sure, antler size is important; we simply cannot overlook this fact. But there are other things that define a trophy besides the size of the rack. What if you crawled on your belly 200 yards to get into a favorable shooting position near a wheat field? 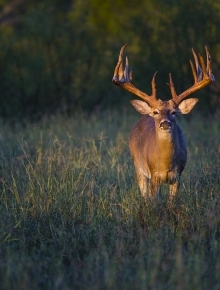 What if you rattled up a buck? These help define a trophy experience, no matter the size of the rack. I grew up in a hunting family in Michigan. It was a time where three or four generations came together to spend time, share stories and hopefully find a deer or a pheasant. But it was not about antler score or the number of roosters you killed; it was more about how you went about it, and if you came home empty handed, well, so be it; that is a part of hunting. There are profound trophies along the trail in the pursuit of game animals, but for me, none of them involve measuring the animal in inches or pounds. This ideology guarantees that all of my outdoor experiences are full of the richness of creation and the challenges of nature. Hunting has been a great venue to build relationships with my kids and grandkids. One of my most enjoyable hunts was harvesting a five point buck with my 6-year-old grandson last year. Truthfully, that was just as enjoyable, and even more satisfying as when I shot an enormous 15-point buck with two drop tines alone a few years ago. Taking an animal does not define a trophy hunt at all, in my mind. The chance to experience the great outdoors with the fellowship and camaraderie of your son or daughter, grandchild, brother or sister, Dad or Mom, or friend is what makes a trophy hunt. The pinnacle for me was getting to the place where I didn’t need to be the one to pull the trigger anymore. Watching my wife kill a gobbler at eight steps with my dad’s Browning shotgun that he gave me for my 16th birthday was a trophy experience that we got to share. When I took my own son out at age seven and called up a gobbler for him that he harvested with his .410 shotgun we had crossed the finish line. I’m just not sure how it could get much better than that. I had a group of friends in high school who leased 200 acres in Jack County for dove hunting. We kept that lease all through college; today I do not remember the shots made or missed but I remember my friends. Some have passed away and some I have lost contact with, but my memory warms me of my friendships formed in that dove field west of Perrin. My hunting continued with deer, bobwhite, turkey and other species, but the memories of each hunt are about who I was with, not the game taken. When I look back on my hunting experiences I can honestly remember every single big game animal I’ve ever harvested including my first bow kill of a doe 40 years ago at the age of 12. In every case I remember who was with me and exactly where I was. I think I could walk to each and every kill site from Michigan to Texas to Alaska without a GPS. The memories of each hunt are etched in my mind even though many of the animals did not qualify as a trophy in the normal sense. For me, a trophy quality hunt or fishing trip is one that brings back special memories with loved ones. I am blessed to have a large “trophy room” full of such memories. Yes I’m still excited to harvest a limit of greenhead mallards, a mature gobbler called in close to the gun, or a nice white-tail with a neck shot, but my greatest trophies are in my mind, not hanging on the wall. I’ve hunted for 70 years. Here’s my perception of a trophy quality hunt as I recall an early hunt from my childhood: a boy and his dad enjoying each other in the great outdoors. No need for a tape measure or scales. On this trip, there were no deer even seen and only a few squirrels killed; the trophy was the spirit of the hunt between a boy and his dad. It was forever implanted—it was a trophy hunt. Watching the miracles of God’s creation is one of the elements of a trophy hunt. It may involve watching a buck make a scrape; watching foolish jakes fighting over a hen decoy, or hearing the chatter of hundreds of mallards overhead at dawn. A satisfying hunt includes spending time outdoors, having a chance to witness the world waking up around me, seeing a sunrise or sunset, being able to whisper to my sons about what they are hearing or seeing, hearing a tom’s gobble echo through the forest; those are the things that give me satisfaction. I was raised by parents who had very few worldly possessions. They shared their love for me by the things they taught me including a love to hunt and fish. From the time I was big enough to follow them they had me in the woods teaching me the value of what God provided. For many hunters, skill, challenge and adventure is what makes for a trophy hunt. I’ve been hunting since I was six. Although I’ve enjoyed many successful hunts with rifle or shotgun, I now find bow hunting most satisfying. Bow hunting is a personal challenge. It requires that I spend as much time as possible getting to know the habits of the game I’m pursuing, constantly being aware of the wind, controlling my nerves, being able to adapt and hunt in terrain I’m not used to, and knowing my equipment very well. When the stars line up and I end up harvesting a mature animal with my bow, I feel like I have accomplished a worthwhile goal and something I can share with and teach my two boys about as they grow up. This is how I define a trophy. A challenging hunt with no success at harvesting an animal is much more fulfilling for me than a somewhat easy successful hunt. Summarizing my most challenging hunt: We rode horseback for more than 10 miles into the mountains. I stalked this cow through dense brush and took a difficult shot across a canyon. I missed the first shot but the second was a clean kill. We rode the horses as close as we could and then hiked down the slope to find the elk. We packed the meat out later in the day with mules. It was awesome and she provided lots of wonderful meat for the family. It is clear that many hunters gauge the quality and satisfaction of a hunt by something other than score. Yes, the size of horns or antlers, the number of birds in the bag, the length of the beard and other measurable criteria are important to many hunters, but these are usually secondary to other aspects of hunting. The skills employed in hunting, the adventure, anticipation and uncertainty of the hunt, the people, the places, the memories and the enjoyment of nature are what define a genuine trophy hunting experience for many hunters. TWA is a large and diverse organization with a wide range of perspectives about trophy hunting. Not everyone agrees on all issues. But perhaps we can agree that hunting heritage, hunting ethics, the love of nature and stewardship of wildlife are core values that we all subscribe to. As we enter this hunting season may we each remember afresh why we hunt, and may we savor every day in the field, every moment with friends and loved ones and every encounter with wildlife.